A cat-sized, weasel-like animal whose habitat in forests along California’s northern coast is under threat from marijuana cultivation should receive endangered species status, state fish and wildlife officials said. The Humboldt marten — a relative of minks and otters — faces the risk of extinction after decades of trapping and forest clearing, according to a report released Thursday by the state Department of Fish and Wildlife that recommends the animal be listed under the state’s endangered species act. Trapping is no longer allowed in California, but the marten’s habitat in California is threatened by wildfires, logging, road construction, pot grows and climate change, the report says. 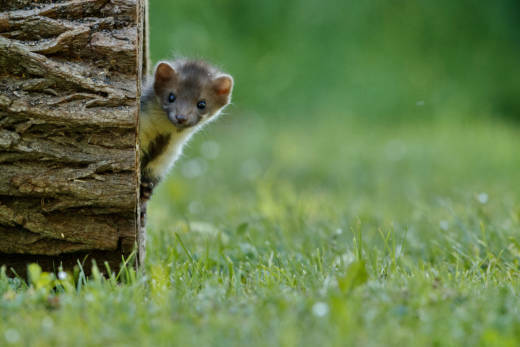 Humboldt marten populations are also imperiled by exposure to toxic pesticides, which are most commonly associated with marijuana cultivation, according to the report. The department’s recommendation now goes to the state fish and game commission, which is expected to make a decision about listing in August. Endangered status under California law limits activities such as construction that could lead to the death of the listed species. The Humboldt marten has fur that can be yellowish or dark brown, a long, sleek body and bushy tail. It typically weighs between one and three pounds. The Humboldt marten was thought to be extinct until it was spotted on national forest land in northwest California in 1996, according to the Center for Biological Diversity. The center was among two groups that petitioned California in 2015 to list the marten as endangered. The California population is estimated to number fewer than 200. The animal is also found in Oregon, where officials estimate its population at less than a few hundred. Conservation groups in April filed a petition asking Oregon officials to ban trapping of Humboldt martens.